The value proposition of advice is changing. The nature of what investors expect from advisors is changing. And fortunately, the tools available to advisors are evolving as well. 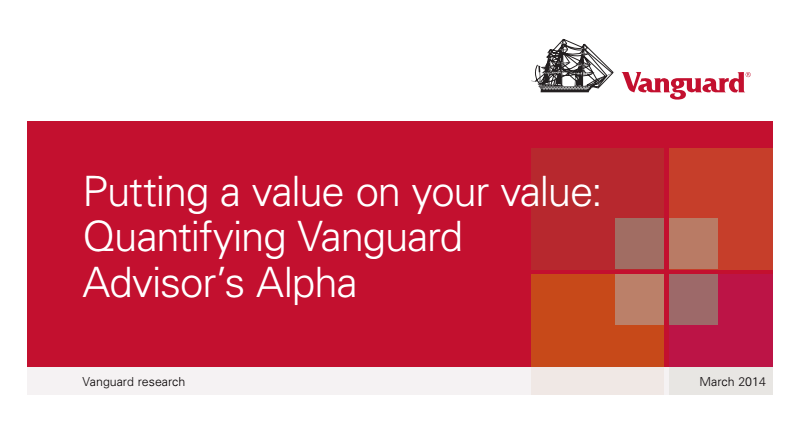 In creating the Vanguard Advisor’s AlphaTM concept in 2001, we outlined how advisors could add value, or alpha, through relationship-oriented services such as providing cogent wealth management via financial planning, discipline, and guidance, rather than by trying to outperform the market. Since then, our work in support of the concept has continued. This paper takes the Advisor’s Alpha framework further by attempting to quantify the benefits that advisors can add relative to others who are not using such strategies. Each of these can be used individually or in combination, depending on the strategy. We believe implementing the Vanguard Advisor’s Alpha framework can add “about 3%” in net returns for your clients and also allow you to differentiate your skills and practice.